That highly anticipated turbodiesel Colorado doesn't make its way to the U.S. until 2016--and it's no doubt going to carry a hefty price premium for its higher fuel economy. 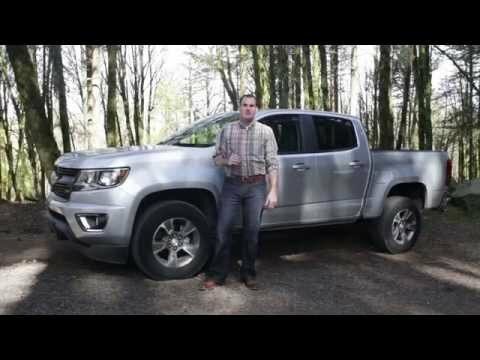 The 2015 Chevy Colorado asks the question: is not-full-size big enough? For many of us, that's a "yes." The mid-size pickup market had, until this year, been almost completely stagnant for the better part of a decade. Few new additions joined the ranks, and those on offer were largely stuck in the late 1990s or early 2000s in terms of technology, capability, and features. 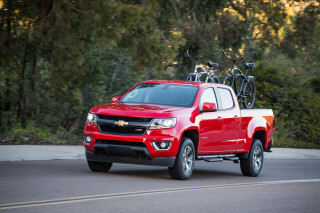 That has changed for the 2015 model year, and the latest upgrade is the 2015 Chevy Colorado. Sharing much of its underpinnings and basic design with the 2015 GMC Canyon, the Colorado isn't a truck revolution—but that makes it no less welcome as a supplement to the full-size trucks roaming the nation's streets, job sites, and dirt roads. 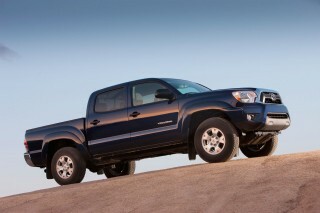 The Colorado stakes a claim on some of the shoppers who'd otherwise buy an aging Toyota Tacoma or Nissan Frontier. 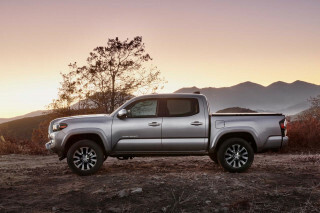 In basic four-cylinder versions, it's some drivers' alternative for an economy sedan or hatchback--but with a maximum bed length of six feet and with its biggest engine a 3.6-liter V-6, the Colorado also can overlap the six-cylinder versions of the new 2014 Chevy Silverado and its kin, the GMC Sierra. GM's latest four- and six-cylinder engines power the new Colorado. The base 2.5-liter in-line four-cylinder comes from a family of fours that powers today's Malibu and Impala, and it's a fine choice for light-duty users who depend on an open bed rather than the top towing and hauling numbers. It's rated at 200 horsepower, coupled to a choice of a manual or automatic six-speed, and happily quiet and unobtrusive as it works hard to provide moderate acceleration. The 3.6-liter V-6 that's also found in Cadillac's ATS and CTS is an option on the Colorado. In this tune, it's good for 305 hp, and it's strong enough to deliver 7,000 pounds of towing capacity and strong mid-range acceleration. It's a little more grumpy about delivering that kind of power, but by no means as unrefined and raw as some of the other sixes in the segment. For even more grunt, there's an upcoming 2.8-liter in-line four turbodiesel, which GM confirms will arrive in 2016. The Colorado rides on a fully boxed frame with a coil front suspension. Electric power steering is standard across the lineup. Four-wheel drive is an option, naturally, and four-wheel disc brakes with long-life rotors are standard. With either powertrain, the Colorado's ride and handling are by far superior to the Tacoma and Frontier. Electric power steering is weighted well, and the suspension setup makes the most out of coil-over front shocks and a live rear axle and leaf springs. With three configurations and three trim levels, the Colorado tries to slice and dice the smaller-truck market in sensible ways. There's a crew-cab model with a five-foot bed for more passenger-heavy uses, and one with a six-foot bed, as well as an extended-cab version with a six-foot bed. No matter which cab is chosen, the Colorado has an excellent interior and space for the front two passengers, with better materials and a better, more natural driving position than the Tacoma or Frontier. In back, it's either a pair of child-safety-sized seats or cramped accommodations for adults, with bolt-upright seatbacks. The Colorado's bed does a better job of pleasing owners than the back seat does, anyway. It's shy on length to full-sizers, but with available bed extenders, an eight-foot object can be brought home without much fuss. Thoughtful touches include a corner bumper step and easy-lowering tailgate on all versions, as well as some 17 tie-down spots inside the bed. It can be fitted with either a spray-in bedliner or a drop-in one; cargo dividers; a system of racks and carriers dubbed GearOn; cargo nets and tonneau covers; a drop-in toolbox; and of course, trailer hitches and harnesses. The Colorado comes in three trim levels, starting with WT work trucks, with the nicely equipped LT in the middle. Trim levels top out at the Z71 off-road specialist--it gets its own headlamps, 17-inch wheels, and dark-metal grille trim. All versions have six airbags, stability control with trailer-sway control, and hill start assist; Z71 models also get hill descent control. Forward-collision alert and lane-departure warning systems are available, and a rearview camera is standard. On the connectivity front, all Colorados come with a USB port and touchscreen-controlled audio. Bluetooth is available, as is an eight-inch touchscreen (on LT and Z71 Colorados) and multiple USB ports for charging and music storage. Navigation is an option, as is GM's OnStar service and 4G LTE data connectivity. The Chevy Colorado hangs on to more global-truck cues than its Canyon twin; we like the traditional look better. Trucks usually stick to a set of rigid styling cues, especially GM's full-sizers. The Silverado and Sierra are as rectilinear as they come--which makes the mid-size Colorado look all the more interesting by comparison. It's not the direct homage to the bigger truck that the Canyon is to the Sierra. The Colorado wears a relatively slim grille, boxed-out fenders, and a rising shoulder line that doesn't favor the bigger Silverado at all. It's more a globally influenced look than any three of its stablemates, and even if we don't think it's quite as convincing as those square-jawed trucks, it still pulls off a burly, rugged, and capable stance. Those slight references to a more widespread audience? It's because at heart the Colorado is a version of the truck GM's been selling around the world since the 2011 Bangkok Motor Show, albeit with a more unusual front-end design. Inside the Colorado, there's a much closer kinship with the Silverado. It's rugged with an upscale finish, and better finishes than you'll find in any Tacoma or Frontier. There's a beefy steering wheel with lots of control buttons, a shield-shaped dash wearing the primary controls and an LCD display, and a shifter mounted on a rather wide console that splits the cabin down the middle (at least in front). It's truckish enough, but there's more than a passing resemblance to the latest GM sedans in the bolstering of the seats, the intersection of trim on the doors and dash, and even in the soft-touch, aluminum-look trim itself. Four- and six-cylinders line up perfectly with the Colorado's mission; steering and ride outpoint the Japanese rivals by a wide margin. The Chevy Colorado can be used as an economy car or a more than moderately capable truck. If you're interested in driving it daily without any notion of pulling more than the occasional jet ski, the four-cylinder is the right engine to choose. It's spawned from the same family of fours that's found in the Impala, Malibu, even the Cadillac ATS and CTS lineups. With 200 horsepower and 191 pound-feet of torque, the four's the only choice if you're interested in a six-speed manual transmission. We've only driven the four-cylinder with the six-speed automatic that's bound to be found on most of these trucks, and we're impressed. It's the frugal choice if your idea of payload is more about the openness of the Colorado's bed, instead of the poundage that can be tossed in it. The four-cylinder works hard but mostly unobtrusively to deliver acceleration that's fine for merging onto freeways; it's smoother, actually, than the bigger V-6, and it's rated at up to 22 mpg combined by the EPA. It can't sip fuel like a real economy-car champ--like a diesel Chevy Cruze--but that combined number comes with an open-air luggage rack that can tote everything from furniture to Christmas trees. The four-cylinder's a much better match for far more drivers than the base engines in either the Tacoma or Frontier. A 2.8-liter in-line turbodiesel four is due to come to the Colorado lineup in 2016. If you're hauling more than tools and bikes and gear, or downsizing from a mas-macho full-size pickup, the V-6 is the right pick. Rated at 305 horsepower and 269 pound-feet of output, this Colorado has power and pulling ratings more in line with the quarter-ton trucks of a decade ago. And given that the same engine's also found in the Cadillac lineup, it's smooth enough, with fuel economy down only a mile per gallon or two to the four-cylinder. It's not quite as quiet as the four-cylinder, but its powerful punch, its transmission's tow/haul mode and automatic grade braking are prescription-strength for pulling ATVs and small trailers. Payload and towing ratings are the 0-60 mph measure of pickup trucks, and the Colorado doesn't flinch here either. Rated at between 1,410 to 1,540 pounds for payload capacity, the Colorado checks in just shy of the GMC Canyon sibling, but its towing is rated identically at a minimum of 3,500 pounds. The Colorado picks right up where most sport-utility crossovers and minivans tail off, and at the top end, its 7,000-pound tow rating is higher than that in the Frontier and Tacoma, not to mention most lower-end versions of the Silverado, Sierra, Ram, and F-150. A base Ram 1500 V-6's max tow rating is pegged at 4,190 pounds, for example. Four-wheel drive is an option on the Colorado, but it's a mechanically simpler setup than the AutoTrac system offered on the Canyon, and its automatic mode. The Colorado rides on a fully boxed frame with a coil front suspension. Electric power steering is standard across the lineup. Four-wheel drive is an option, naturally, and four-wheel disc brakes with long-life rotors are standard. The Colorado smooths over bumps deftly, and the steering tracks mostly true, though like any body-on-ladder-frame design, the mid-sizer transmits a fair share of secondary ride motions through to the cabin. If you're returning to mid-size trucks from compact crossovers, you'll notice the difference--but it's not as much of a downgrade as, say, stepping back into a Wrangler. Front seats in the Colorado are very good and, importantly, even the extended-cab model can carry a child seat in back. Mid-size trucks are the right-size trucks for people who use them as commuter tools and only for light towing. When pressed into heavier-duty tasks, the Colorado actually does a better job of satisfying those who pull stuff than those who carry more people. 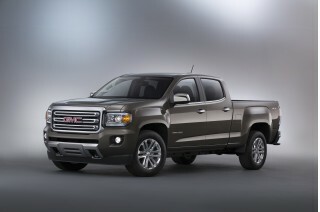 The Colorado, like its GMC Canyon twin, comes in a choice of extended-cab and crew-cab models. Extended-cab trucks come with a six-foot bed, while crew cabs come with a choice of either five- or six-foot beds. In either configuration, the news is good for front passengers. The current Tacoma and Frontier look and feel positively antique when you slide into the Colorado, with its nicely finished dash, supportive but somewhat narrow front seats, and ample storage bins and trays. The Colorado's a feat of modern engineering--in stark contrast--and the higher hip point and more abundant headroom are obvious, and a boon to bigger drivers. The Colorado has a natural driving position, not the splayed-out, legs-out stance required in the other trucks. 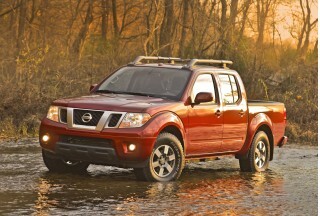 The Colorado puts the Frontier and Tacoma to shame in fit and finish and interior quality, too. There's a floor-mounted shifter in a tall center console that's deep enough to store an iPad. There's at least one USB port, and up to four, and a useful tray just ahead of it on the console. The shifter location's a minor concern, as it sits close to the driver's knee, but it's a minor gripe in a cabin so well turned-out, especially for the class. As for the back seat, it's a less convincing substitute for a good compact sedan. Adults simply won't be comfortable, even though the Colorado claims mid-size status here, too. There's just not enough room in the extended-cab model for anything except a child safety seat, and even then, it's not as easy to access with the rear-hinged door opening. The crew cab has better leg room and knee room, but the cushions sit low, and the seatbacks are bolt upright against the bed wall. Most owners will use the under-seat storage more than the seats themselves, we think. The bed's much better configured for day-in, day-out use. It's shy on length to full-sizers, but with available bed extenders, an eight-foot object can be brought home without much fuss. Thoughtful touches abound in the bed: there's a corner bumper step and easy-lowering tailgate on all versions, as well as some 17 tie-down spots inside the bed. It can be fitted with either a spray-in bedliner or a drop-in one; cargo dividers; a system of racks and carriers dubbed GearOn; cargo nets and tonneau covers; a drop-in toolbox; and of course, trailer hitches and harnesses. By the numbers, the Colorado can tote between 1,410 and 1,590 pounds of payload, and can tow a minimum of 3,500 pounds--7,000 pounds at the max rating. It's a perfect bridge between the family crossover and the megatrucks we call full-sizers today, but mostly if you're unconcerned with carrying full-sized people in the back seats. Crash-test scores are neither complete nor unanimously positive yet; however a rearview camera is standard on the Colorado, and advanced safety features are a first in mid-size trucks. GM has fitted enough standard and optional safety gear in its new mid-size trucks to position them as the safest of their kind. Yet its crash tests so far haven't been all that impressive. All Colorados come with six standard airbags that have larger side bags meant to prevent passengers from being ejected in a rollover. Oversized side mirrors give better visibility, and a rearview camera is standard. In addition to the standard stability-control system, the Colorado also gets standard trailer sway control and hill-descent control systems. The Colorado can be upfitted with safety technology like forward-collision alerts and a lane-departure warning system, both a first for the mid-size truck segment (along with the Canyon). That could help the Colorado earn a Top Safety Pick+ award from the Insurance Institute for Highway Safety (IIHS). However at this time, the only full set of crash-test information available for the Colorado comes from the National Highway Traffic Safety Administration (NHTSA), which has given the new Chevy truck just four stars overall, with four- and five-star scores for frontal and side impact, respectively. With bed accessories for any weekend work or play, and in-cab tech leagues beyond the other players, the Colorado is a leader in features. 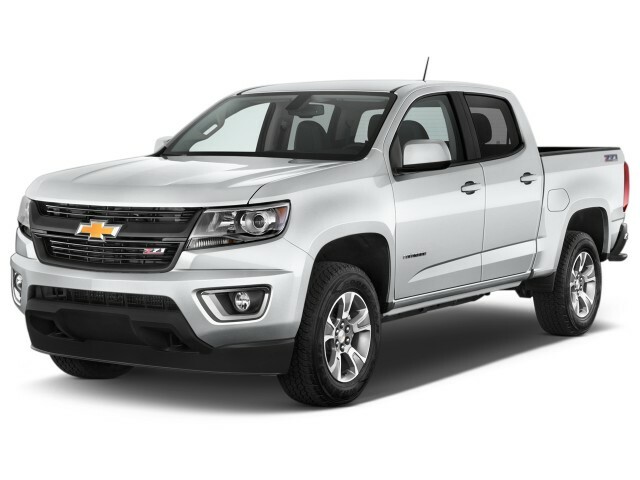 The Colorado comes in three trim levels--WT, LT and Z71. Standard equipment on each includes air conditioning; power windows; an AM/FM radio with a USB port and a 4.2-inch color touchscreen interface; vinyl seats; tilt steering; a corner-step rear bumper; a locking tailgate; and a rearview camera. Base WT trucks can be trimmed up with an appearance package or with a convenience package that includes remote keyless entry and cruise control. On the connectivity front, Bluetooth is available, as will a touchscreen interface with an eight-inch screen (on LT and Z71 Colorados) and multiple USB ports for charging and music storage. Navigation is an option, as will GM's OnStar service and LTE 4g connectivity beyond a free trial period. Other available or standard features on LT and Z71 Colorados include an easy-lowering tailgate; Bose premium audio; heated front seats; remote start; steering-wheel audio controls; and a sliding rear window. On the accessory front, the Colorado's bed comes with the locking tailgate and bed lighting, and stamped-in detents for two-tier loading. The Colorado has 13 reconfigurable and 4 stationary load tie-downs in the bed; a factory sprayed-in bed liner is available, as are dozens of accessory systems for loading everything from sport bikes to construction materials, depending on the daily duty you have in mind. Gas mileage isn't strikingly high, but the Colorado earns combined numbers in the low 20s, and a turbodiesel is on the way. The new Chevy Colorado earns the best fuel-economy numbers among mid-size pickups (along with the GMC Canyon, its twin)--but comparing its V-6 to V-6 full-size trucks makes things much closer. The Colorado's best EPA combined rating comes with the base four-cylinder equipped with rear-wheel drive and an automatic transmission. It's pegged at 22 mpg combined, or 20 mpg city, 27 mpg highway. With a manual, the numbers are 19/26/22 mpg; with four-wheel drive, the automatic Colorado checks in at 19/25/21 mpg. Consider that against a six-cylinder GMC Sierra, which is rated at 19 mpg combined. However, against its rivals, it's a better story. 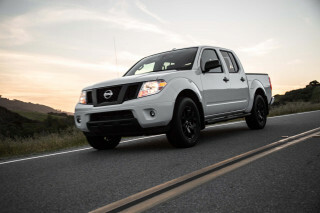 The four-cylinder Nissan Frontier with a manual earns 21 mpg combined; the Tacoma four-cylinder manual matches the Colorado at 22 mpg combined. Among six-cylinders, the Colorado tops out at 21 mpg combined with rear-wheel drive and 20 mpg with four-wheel drive. The Tacoma and Frontier top out at 19 mpg combined. Our own experience with a similar GMC Canyon and about 1000 pounds of payload suggests 22 mpg is easy to achieve on long interstate slogs. For what it's worth, though, a six-cylinder Ram 1500 automatic is EPA-rated at 21 mpg combined. I've owned a 2005 Colorado, since the beginning Ive struggled with ignition. Dealer couldn't find what it was, I randomly had problems starting it. I recommended for dealer to check gas tank, since Chevys are... I've owned a 2005 Colorado, since the beginning Ive struggled with ignition. Dealer couldn't find what it was, I randomly had problems starting it. I recommended for dealer to check gas tank, since Chevys are known for malfunctioning of the gas tank. Interior is cheap. Seats have poor quality. amazing truck. MPG as advertised. love every feature. Truck meets all work requirements with style, efficiency and comfort; easy and fun to drive. Comfortable, reliable, easy to drive.